Supreme Fries – The Next Great Late Night Food? We know you’ve heard of carne asada fries, one of California’s biggest staples of recent years, but what if you want to switch it up from time to time on those late nights out? Benny’s – as always – has you covered. Our Supreme fries are an evolution of one of California’s staple sides and what distinguishes it from most other places is something very simple: Choice. Usually these kinds of fries are served exclusively with Carne Asada with a helping of shredded cheese, sour cream, guacamole and pico de gallo on top of a plate of fries. With our Supreme Fries you’ll get all those things (with Benny’s signature freshness) and your choice of our very own carne asada, chipotle or rotisserie chicken, carnitas, fish, shrimp or lobster. Yes, you read that list correctly. While not seen in traditional Mexican restaurants, Supreme Fries have become a California staple and are often a great go-to before or after a big night on the town. They originated in San Diego and have since made their way across the state, picking up various distinctions between cities. Benny’s likes to go big though, and in addition to the standard ingredients and meat selection we offer optional pickled jalapenos and even beans as part of the serving (black or pinto… yeah, choice)! We recommend mixing and matching different meats and toppings to see which ones become your ideal Supreme Fries. Do you prefer Classic carne asada with all the main fixings? Maybe Rotisserie chicken with black beans is more your thing. How about carnitas with pinto beans and pickled jalapenos? The options are there and there’s never a bad time to try something new! 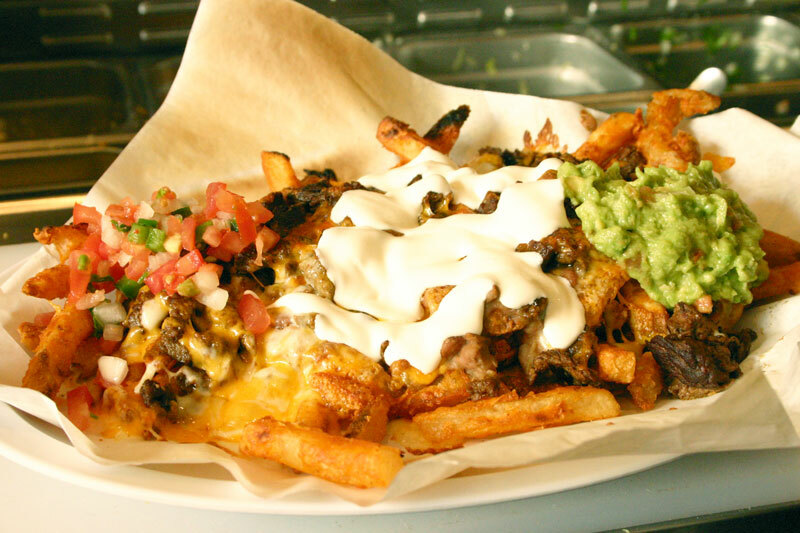 Supreme Fries, specifically the carne asada variation, are a recent invention (late 90s’) but have taken the South West portion of the United State by storm! It’s hard to walk into any California Mexican establishment and NOT find them but if you’re on a quest for the perfect combination that suits YOU… well, Benny’s has you covered. The ingredients are fresh, the fries are crisp, the meat is whatever you want it to be and your stomach will be happy you treated it to something tasty. Now, stop salivating over photos and head over to Benny’s. It’s a great time to indulge in this new California favorite! Want more delicious pictures of food uploaded regularly? You should follow us on Facebook and Instagram! Or feel free to see if something else appeals to you on our menu and be sure to stop by the next time you are in the LA area.